It’s the new year, and that means that we’re all about to get bombarded with tons of messages to change…to be better….to do more….to make this year a better year than ever before. The problem with that is that unless a resolution is made with motivation—far more motivation than a date change on a calendar—then it’s not likely to stick. In fact, if statistics hold, then only eight percent of people who make a resolution this year will end up keeping it. At RECON, we go into this subject a lot more in our RECON: Global program, but if you’re really looking to make some changes in your life, there is a better way—create SMART goals to help you get there. SMART goals—goals that are Specific, Measurable, Attainable, Relevant and Timely—are built to provide accountability and detail, two things you’ll need in order to truly be successful. 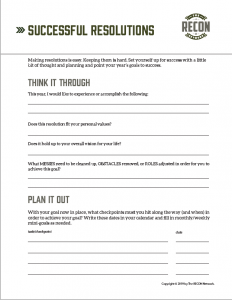 In the meantime, you can work through your resolutions with our new Resolutions worksheet (download here) to start putting a little bit of thought into the change you want to make. Want more of this? Sign up for RECON: Global and learn more about yourself, your life’s purpose, and goal setting for success.